We knew it was coming. They just had to play the game and keep up with the competition. And, Monday, they did it. Microsoft finally had its Apple moment. Microsoft unveiled a family of home-brewed tablets to rival Apple's iPad at an extremely hush-hush event in Los Angeles shrouded in mystery and speculation. This is a huge leap for Microsoft with a mobile-friendly tablet, built on its new Window 8 operating system, which rolls out this fall. The Surface Pro and RT tablets will be designed in-house, not outsourced. The interest in tablet-type computers like iPads is soaring. Even some tablets built on Google's rival Android mobile operating system, such as the Amazon Kindle Fire, are selling strongly. 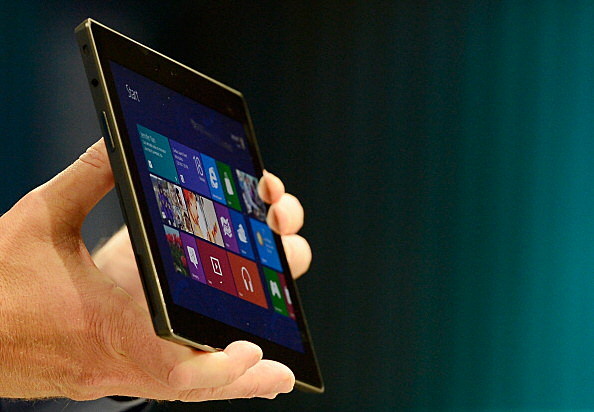 Microsoft is no stranger to tablets. Back in 2001, Microsoft Co-founder Bill Gates predicted tablets would be the most popular form of PCs sold in America within five years. Tablets still haven't overtaken PCs, but they finally have the momentum-thanks to Apple, not Microsoft. So, we welcome "Surface." The new Microsoft Surface will feature a 10.6-inch wide display with Gorilla Glass, its own stand, a full-size USB port, dual Wi-Fi antennae, a multitouch keyboard and a trackpad - and yet is only about a half-inch thick, says Windows chief Steven Sinofsky. Models will come with either 64 gigabytes or 128 GB of storage. What do you think? Would you buy this, or another 'tablet' out there?